Warning bells are ringing for India. Even as news drops in from Odisha that Adivasi villages, one after another, are rejecting the top UK-based MNC Vedanta's plea for mining, a recent move by two senior scholars Felix Padel and Samarendra Das suggests the way tribals are being exploited in India by powerful international and national business interests may become an international issue. In fact, one has only to count days when things may be taken up at the United Nations level, with India being pushed to the corner. Padel, it may be recalled, is a major British authority on indigenous peoples across the world, with several scholarly books to his credit. Recently the two scholars, known for their studies on Adivasi areas of India, presented a paper at a conference organised by Paris-based SOGIP project, (acronym for "Scales of governance, the United Nations, governments and Aboriginal peoples to self-determination at the time of globalization"), a lobbying group at the UN for those fighting for tribals' interests. The paper, widely acclaimed by those present, underlined, "As investment in mining and metal production rises rapidly from the world’s financial centres, the takeovers of indigenous people’s land and resources escalate, in India as in other ‘developing countries’, with all the familiar signs of the resource curse,including severe repression and manipulated civil war." 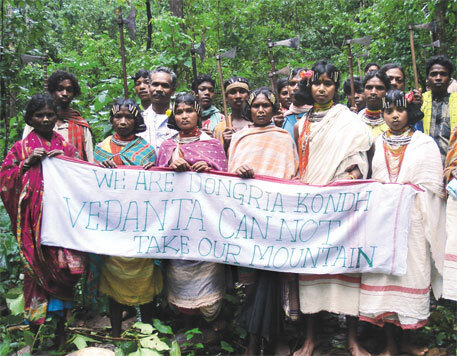 Already, Vedanta mining move is meeting with stiff protests in Delhi, Niyamgiri in Orissa and in Goa. The plan is to take the protests to London. According to NGO sources, the international solidarity group Foil Vedanta will lead a major annual demonstration in London, storming the All General-Body Meeting (AGM) of Vedanta Resources to be held on 1st August'13. All this is happening with five gram sabhas in Odisha in the villages of Serkapadhi, Kesarpadhi, Tadijhola, Kunakadu and Palberi the five villagers have expressed a thundering no to the proposed mining activity by Vedanta. Taking Vedanta's plan as a case in point, the paper, titled "Can Adivasis stop the race to the bottom?" says, "In India, as in other countries rich in mineral resources, indigenous communities are facing a multi-dimensional invasion of their lands by mining companies and the ‘mafia’ elements that invariably seem toform part of mining and metal producing operations. Many of the areas where Adivasis live are rich in minerals, so as mining-based projects proliferate, boosted by foreign investment seeking profits from India’s resources, their impact on Adivasis has become enormous." Pointing out that the land rights of tribal people are guaranteed by the 5th and 6th Schedules of India’s Constitution, the scholars say, "This is complicated by this ambiguity as to which groups of people are classified as Scheduled Tribes, the non-inclusion of a large proportion of tribal villages under the specified Scheduled Areas, and the loophole that allows the sale of tribal lands for projects deemed ‘in the national interest’or for ‘public purpose’. This loophole has caused the displacement of perhaps 20 million tribal people - a quarter of India’s Scheduled Tribe population - within the last 60 years." Accusing such top mining companies such as Tata, Jindal, Posco, Mittal and Vedanta for forcing through projects in tribal areas through the deployment of massed police –often hundreds at a time - who frequently express strong anti-Adivasi prejudice, the scholars believe this has led to "many atrocities recorded by human rights groups – atrocities which are alienating Adivasis from mainstream authorities with unprecedented force." They underline, "Many Adivasis have joined the Maoists, and hundreds – probably thousands – of Adivasis have been tortured and killed by security forces and falsely charged or imprisoned as Maoists when they are not. India’s present Tribal Affairs Minister, Kishore Chandra Deo, has been outspoken about these atrocity tactics as well as the forcing through of mining projects without the consent of tribal communities." Commenting on this connection and the massacre by security forces of 17 innocent Adivasis (including children) at the village of Ehadsameta in Bijapur district, Chhattisgrah, on May 17, 2013, the minister had said: ‘It’s no excuse to say that they were being used as human shields and hence they massacred them. Why were they being used as human shields? You have to go into the causes for that. Once you understand that then you can get to the root of the problem… If mining clearances are given without the consent of tribals then you will only be antagonizing them." The scholars comment, "The Forest Rights Act of 2006 (FRA) has begun to settle longstanding claims of Adivasis to forest lands, but neither this nor PESA – the Panchayat (Extension to Scheduled Areas) Act of 1996 – have been properly implemented. Complaining of this, Kishore Chandra Deo has been outspoken about the complete lack of consultation with his Tribal Ministry over clearances for mining projects in tribal areas, and the vested interests that are fuelling the bloody war against the Maoists in these areas." In fact, the scholars find a pattern of repression and resistance evident in projects promoting India’s aluminium industry as much as its steel industry, as in new bauxite mines in the Eastern Ghats of south Odisha and northeast Andhra Pradesh. "One of these planned bauxite mines, in the Niyamgiri range of Odisha, promoted by the London-based Vedanta group of companies, has come into prominent international view, due to strong opposition to mining by Niyamgiri’s indigenous inhabitants, the Dongria Konds", the scholars say. "After complex legal wrangles from 2003, the Ministry of Environment and Forests refused clearance to Vedanta’s mining plans in August 2011,on the basis of illegal felling of trees by the company, misleading de-linking between its Lanjigarh refinery and planned bauxite mine,and failure to consult the Dongria. An appeal against this decision at India’s Supreme Court by the Orissa Mining Corporation ended in a landmark judgement on April 18, 2013 that called for the Dongria to decide whether they want mines in Niyamgiri through a number of gramsabhas", the scholars emphasise. "The case hinges on traditional rights applications under the Forest Rights Act (FRA), and restricts the question to one of religion andthe cultural and land rights of tribal people over a mountain they regard as sacred. Proper implementation remains in question as we write, following serious police repression that has been reported pressurizing Dongria villagers to give their ‘consent’ for Vedanta’s mine. This has involved anti-Maoist ‘combing operations’ by the CRPF (Central Reserve Police Force), in which shots have even been fired at children bathing in a waterfall", the scholars recall. The scholars quote the minister as saying that the main threat today is the mining in Schedule V areas which has shaken "the confidence and faith of the people in the region in our democratic system. In many cases powerful lobbies are trying to encourage mining themselves in flagrant violation of constitutionalprovisions and safeguards guaranteed by our founding fathers and alsoin utter contempt of land transfer regulations which have been enacted by various State Governments and without any regard to other prevailing laws of the land."